Christ Church Burial Ground, 5th and Arch Streets, Old City Philadelphia. To see the full sized picture, just click directly on the photo. Christ Church Burial Ground has over 1,400 graves, not all of them marked. But the most famous are those of Benjamin Franklin - and four other signers of the Declaration of Independence. The five graves represent nearly 10%, of the total number of 56 signatories, to the charter of freedom. By doing so, all of them risked "their lives, fortunes, and sacred honor" on behalf of the upstart 13 American colonies, in their battle against the British Empire, the most powerful in the world at that time. For the most up-to-date information, you can visit the official Christ Church Burial Ground web site for visitors. Its official address is 5th and Arch Streets, Philadelphia, PA 19107. One important note: the Burial Ground is closed entirely, due to the frigid temperatures - and slow visitor season - of January and February. 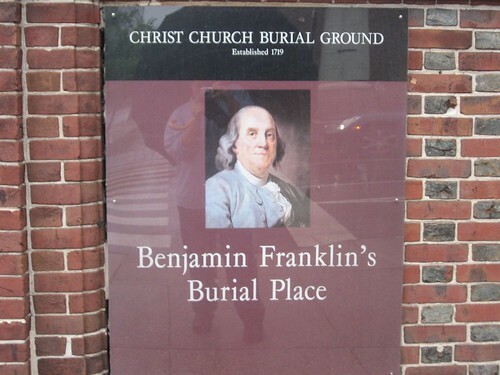 That having been said, you can still view Franklin's Grave from the outside, as you can see through the bars and pitch pennies onto the grave, as well as read the commemorative plaques. In addition, the Burial Ground is not open during inclement weather, so please plan accordingly - call Christ Church and ask if you're not sure. Guided tours take place from 10:00 AM to 3:00 PM, every hour, on the hour. You can, of course, take a self-guided tour at any time, particularly if you are in a hurry, and making your visit as part of our One Day Tour of Philadelphia. But if you have the time, we'd recommend that you take the guided tour. Christ Church Burial Ground is a bargain, as it is almost free. It is just $2 for adults, $1 for students. If you have a group of up to 25 people, it maxes out at $10. It is easily accessible via SEPTA, which is what we'd recommend. You can take any inbound SEPTA Regional Rail train to Market East Station, located at 11th and Market Streets. From there, you can take any eastbound SEPTA bus on Market Street, and disembark at 4th, 5th, or 6th Street. The Burial Ground occupies the southeast corner of 5th and Arch Streets. Once you get off the bus, you just walk north to Arch, the next east-west street above Market. You can also take the Blue Line / Market-Frankford Line / "the el". Once you leave the Market East Station train platforms, you can stay underground and follow signs for the Market-Frankford Line. Just make sure you follow the signs for "Eastbound to Frankford". Once you're on the Blue Line train, it is only two stops to 5th Street. Disembark there, and just walk one block north, to 5th and Arch. And if the weather is pleasant and you'd like the walk, you can easily walk there from Market East. It is a seven-block walk, 0.6 miles, and it will take about 13 minutes. Just walk east on Market Street, from 11th Street to 5th Street, until you reach the intersection. Turn left on 5th and walk the one block north to the Burial Ground, at Arch Street. If you have some time for sightseeing, a fine idea would be to combine a visit to the remarkable National Constitution Center, which is right down the block, along with the Burial Ground. Another important note: It would be logical to reason that the Burial Ground would be directly adjacent to Christ Church itself. But it isn't. It is, in fact, a seven-minute, 0.4 mile walk, from Christ Church at 2nd Street, just above Market, to the 5th and Arch location of the Burial Ground - about four blocks, taking either Market or Arch Streets. The red teardrop, on the right, is the location of Christ Church Burial Ground - Market East Station is the blue train icon on the left. If you'd like to return to the One Day Tour of Philadelphia, please click here. If you'd like to return to Old City Philadelphia, please click here.